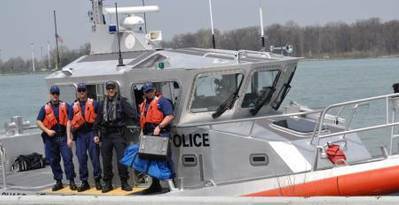 A U.S. Coast Guard and Royal Canadian Mounted Police law enforcement boat crew conducted the first Shiprider patrol of the 2014 Great Lakes boating season, Thursday, in Lake Erie. The Shiprider Program allows U.S. and Canadian maritime law enforcement officers to embark together on joint patrols to integrate operations on and near shared maritime borders. Law enforcement officers from Coast Guard Station Belle Isle, Michigan and a RCMP officer from Windsor, Ontario, embarked on a Coast Guard 45-foot response boat for the patrol in Lake Erie. "With years of diplomatic activity on both sides of the Northern Border leading up to this moment, the Coast Guard and RCMP of the Detroit/Windsor area are advancing operations this year with groundbreaking operational intelligence culled from new radar systems," said Lt. j.g. Athena Fried, assistant enforcement division officer at Coast Guard Sector Detroit. "This heightened level of binational information sharing will permit law enforcement authorities on both sides of the border to better position Shiprider patrols to make cross border interdictions." During the first full Shiprider season in 2013, the Coast Guard and RCMP conducted 37 patrols for 193 hours underway, conducted 56 boardings and found zero infractions. Regularized Shiprider operations respect the sovereignty of both the U.S. and Canada and are based on the principles of shared border management, effective law enforcement, appropriate and measured information sharing, and robust privacy protection. Shiprider operations enhance both Canadian and U.S. security in shared waterways.